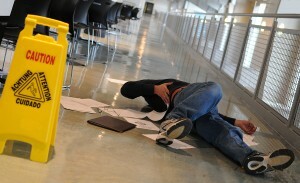 Have you been injured due to a slip or fall? Slip and Fall accidents are the second-leading cause of injury in Las Vegas, and whether due to water, ice, oil, uneven payment, improper wet-floor signage or anything else, can be a major risk to health and safety. An accidental slip or fall can lead to temporary or permanent disability, loss of work, expensive medical bills, inability to care for your family and pain and suffering that you have had to endure. In these cases, it pays to have the right lawyer representing you. You may be eligible for compensation, which can help offset the cost of any medical bills incurred or make up for lost income or other losses you have experienced as a result.Whether your accident was a “slip and fall” in the lobby of a Casino or a “slip and trip” getting out of a taxi on the Strip, you may be eligible for substantial payment. Proving and winning your case can be difficult and that is where Page Law Office can help. By interviewing witnesses at the scene and reviewing surveillance videos, the property owner and consulting experts in relation to your specific case, we can assist you in getting the compensation you deserve. Through thorough investigation and dedicated evidence-gathering, we can determine who was at-fault and whether your claim has the merit it needs to stand up in court. We will work to get you the claim you need, and have a history of getting results. However, time is of the essence. If you’ve been injured, Nevada’s statutory deadlines regarding personal injury laws give you a limit of two years to file your case with the courts, and arranging the case with your representative can take up a great deal of that time. For help with your slip and fall case, give Page Law Office a call today.